When we are young we are told when we say a bad word. Depending on language and culture what these bad words are can be different. As adults, however, it seems we are left to our discretion as to what words are acceptable. Sure there are social rules, but they are sadly too often ignored. I firmly believe there is a list of words that as an adult should be taken out of our vocabulary. Especially if as an adult you want to be a successful and driven adult. One of the first words I would recommend reducing, if not eliminating, is try. When I hear a person say they are going to try something it sounds weak to me. 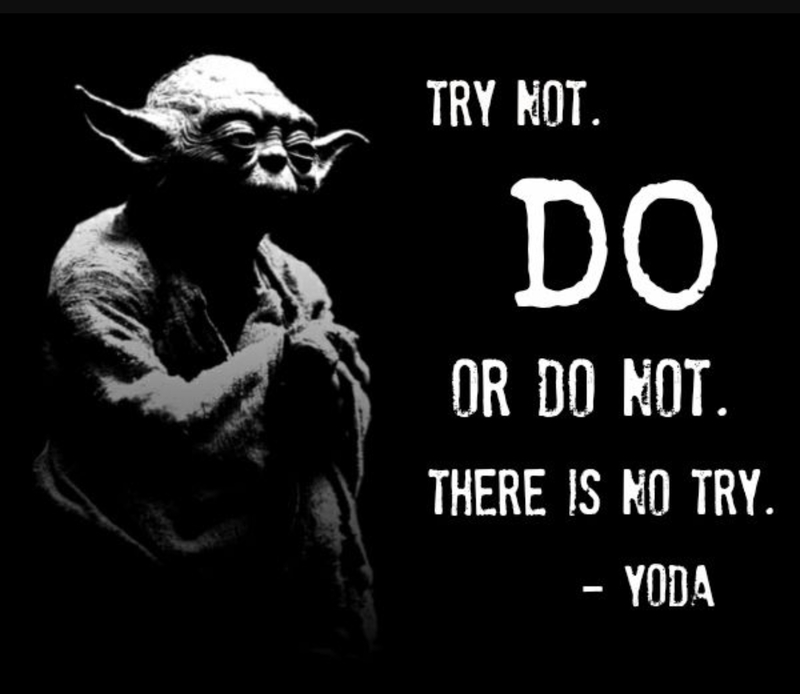 I am reminded of the quote from Yoda above. In writing my next book I strove to answer the question everyone seems to ask me. That question is, “How did you become the person you are today?” There are a million different tools and tricks I use daily, but meditating on that question today I came to realize they all point back to one guiding principle. The thing that changed my life more than anything else can be, and has been, called many different things. In his best-selling book Think and Grow Rich Napoleon Hill calls it ‘definiteness of purpose’. In my own book I refer to it as your declaration, or life mission. When someone declares something they are not trying it. They are saying they will keep working at it until it is done. Prove to yourself the truth of what we are talking about here. Find a place where you can be alone, or if you are confident feel free to try this right where you are. Pick a goal you would like to accomplish. For example, I am working on becoming a best-selling author. Now, relax, clear your throat and say you will try your goal. In my case, “I will try to be a best-selling author.” How does that feel to you? To me it feels like I will put in some effort, but the result is up to outside circumstances, something beyond my control. Now, stand up, maybe shake things out a bit, clear your throat again and replace the word ‘try’ with the word ‘determined’. It should sound something like this “I am determined to become a best-selling author.” Spoken with a sense of conviction and backed by a strong ‘why’ you can’t be beat. Judge for yourself. How did the second statement sound? To me it sounds like I will keep going until I find a way that works. As adults we do not value both the power of words as well as the influence of our internal conversation has over our lives. Begin now to change your outer conversation and try to reduce and eventually eliminate words like ‘try’ and ‘impossible’. These words not only do not motivate us, but give us an out, or more directly, an excuse for not accomplishing our goals. Feel free to share other words you feel should be eliminated from the vocabulary of successful people. Awesome content 😊👏🏻. I just loved it so much ! !